Repackaged editions of The Mortal Instruments and The Infernal Devices will be published in less than a week (September 1) and to celebrate, Cassandra Clare shared something very special: a snippet from Jace’s POV in the City of Bones Collector’s Edition. The special edition of City of Bones is the only repackage that’s hardcover. It is only available through Barnes and Noble. Unless people decide to sell it on Ebay, it will never be available anywhere else. All the repackages have maps of New York (TMI) or London (TID) and forwards by me talking a bit about why I wrote each series. 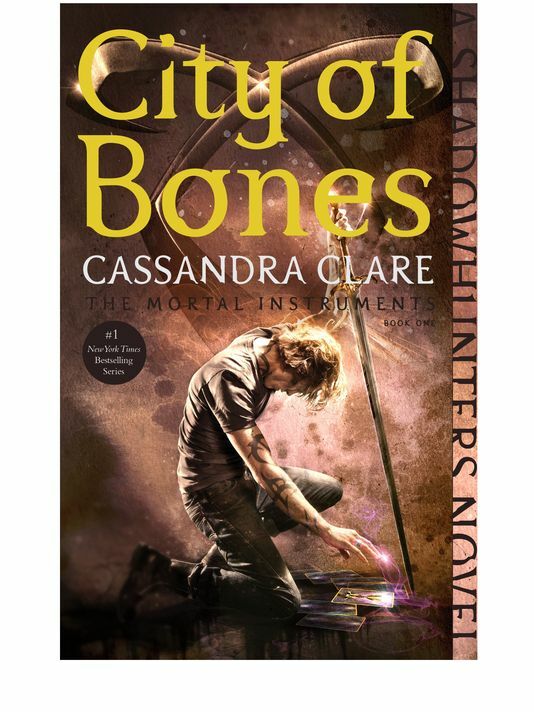 Only the B&N edition is 1) in hardcover 2) a book that contains the opening scene from City of Bones from Jace’s viewpoint. Jace glanced over at Alec and Isabelle. Killing a demon in front of a mundane, unless there was an immediate threat, was something of a no-no. Mundanes weren’t supposed to know about demons. For one of the first times in his life, Jace found himself at a loss. They couldn’t leave the girl with the Eidolon; it would kill her. If they left the Eidolon alone, it would escape, and kill someone else. If they stayed and killed it, they’d be exposed. But she only planted her feet harder. He could see the look in her eyes, like exclamation points: No! No! “Jace!” Isabelle’s eyes flashed. They were depthless, black, angry. Isabelle never got angrier than when Jace risked getting himself in trouble or danger. And he was risking both, now. Breaking the Law — talking about Shadowhunter business with mundanes — and what was worse, he was liking it. Something about this girl, her stormcloud of red hair and her snapping green eyes, made him feel as if his veins were filled with gunpowder and she was a match. As if, if she touched him, he’d burn up. But then, he loved explosions. The Collector’s Edition is only $16.24 right now and international shipping is almost $13. Which editions will you be buying? That sounds wonderful!!! But I like the original covers!!! i just want the snipets and not have to buy the new books, as i already have the old ones. You know, ever since I read my other favorite author’s comment on the back of COB (paperback) I had to buy all 3 first books since they were all out. I was excited! After COG ended I was in a TMI high that I had to go to Cassie’s website n see if she’d continue, n I was so happy she was getting 3 more books out. I fished for everything; every snippet, every quote, picture and cut-out scenes that never made it to the books! And when I finished COHF I was at an awe w my last tear that it ended so well but the stories will always stick with me because I’d re-read the books over and over again until I wear them out. So far, they’re great because I got my hands on the audiobooks as well. But honestly, to buy another book? The same one I already have? I wish I got the extra cash for extra of the same book but it’s just not happening. I’m a big fan, but I love my copies that I already have (3 (COB,COA, COG) paperbacks n 3 (first edition release) hardcovers for COFA, COLS, n COHF, I’m booked out. I rather continue with the story and buy her new releases of the sequels but not backwards. Point made! Happy readings! And did I mention The prequel The Infernal Devices are just as good if not better with the Victorian era! I got my copy on September 3. The paper the book is printed on reminds me of the kind they used for paperbacks in the 1950s (yes, I’m that old). The small fold-out poster in the back by an unfamiliar male artist must be meant to represent Clary. But the representation is nothing like how she is depicted in the books and was depicted in the movie or in the TV show now in production. I hope the new copy Cassie wrote for this collector’s edition makes up for those disappointments. I was going to ask if the other were going to be re-realease as hard cver as well, for my opy of city of ashes and city of glass were paperback. it would have been nice to have all to be re-realease as hardcover so i could mach for a change, but i guess it’s not mean to be. Will all of the books be released in hardcover with the new covers? No, only the Barnes & Nobel Collector’s Edition is in hardcover, the other editions are in paperback.